This recent article reminded me of the photo series that CL Becker shot for us during Liam’s treatment. Undeniable evidence of how far he has come! Balloon travels from Ontario to N.B. A little boy fighting cancer is Ontario has been linked with a Saint John woman through a balloon. CTV’s Mike Cameron explains. 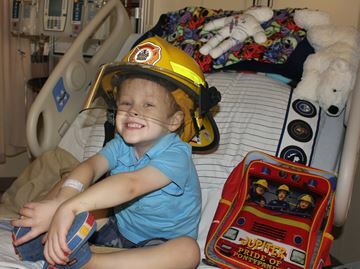 Six-year-old Liam Cuttle was diagnosed with stage four, high-risk neuroblastoma, a type of childhood cancer, just before his fourth birthday. A wayward red helium balloon has become a symbol of hope for one family coping with cancer. Six-year-old Liam Cuttle was diagnosed with stage four, high-risk neuroblastoma, a type of childhood cancer, just before his fourth birthday. He was deemed cancer-free last January but his family continues to raise money for cancer research through their charity called Liam’s Brigade. Liam Cuttle, 4, was diagnosed with neuroblastoma, a cancer of the sympathetic nervous system that usually affects infants and young children. It is the third-most common pediatric cancer (behind leukemia and brain tumours).